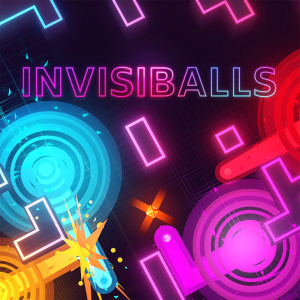 Created by Swiss indie developer Digital Kingdom, Invisiballs describes itself as a “competitive next-gen hide-and-seek,” aiming to utilise the unique features of the Nintendo Switch to make something a little different. It also gives off that immediate multiplayer party vibe that we see so often in the Switch’s digital offerings, with an easy to pick up, one Joy-Con per player approach hoping to allow friends and family to quickly jump in and have a go. So does it achieve these goals, or should it be allowed to slip under your radar? Before we dive into answering that question, it’s worth noting that this is absolutely not a single-player experience; Invisiballs is designed as a competitive two-to-four player game and you’ll definitely need to have a buddy alongside you to play. 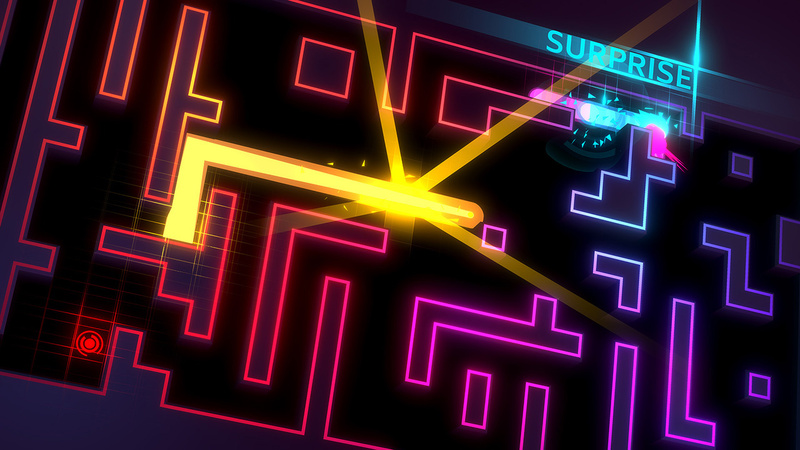 Each of the game’s modes are pretty frantic affairs, especially if you fill out all four available player spaces, and you’ll quickly be zooming around each stage, hoping to better your opponents with quick reactions and clever thinking. 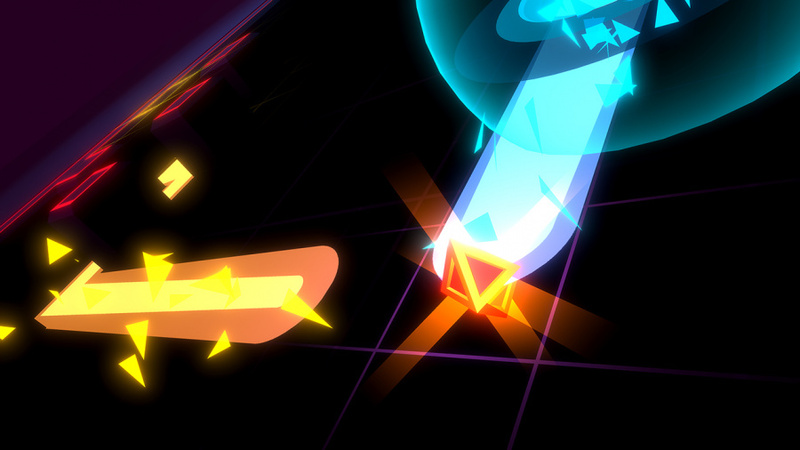 You each play as a ball that can be guided around the game’s various stages with a flick of the control stick. Rather than having complete control, though, your ball will whizz across the entire length of the stage until it rests on a wall or barrier, forcing you to plan routes as you go. Aside from this your only other input is an attack on the ‘A’ button, used to destroy any opponents that cross your path, and this can be charged slightly by holding the button down for a couple of seconds. There is a catch, however; your ball is (for the most part) invisible, and rather than relying on your vision to move around each stage, you’ll actually be using the HD Rumble feature of your Joy-Con to feel when you hit a wall, and also when you pass by an opponent. If you wish, you can actually turn the balls on to full visibility so that you can see them at all times, but considering the vibrations and invisibility make up the game’s main quirk we’d suggest trying to play with it off as standard. At launch there are two modes to choose from. The first of these is called ‘Free For All’, which simply tasks you with killing off your opponents before they can get to you. 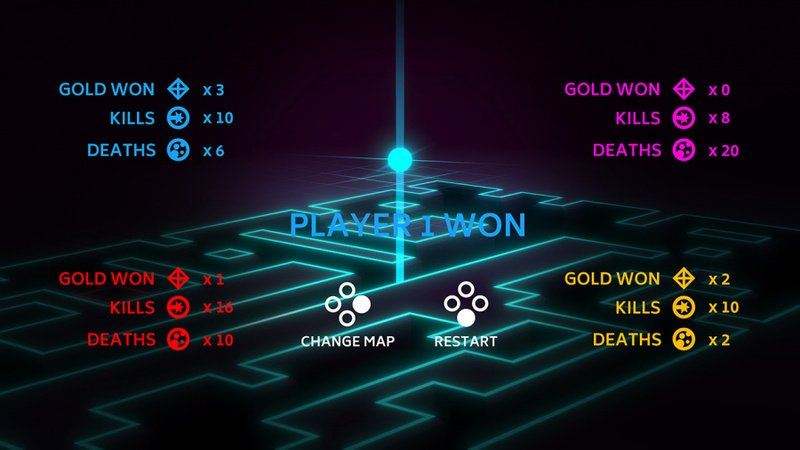 Each kill, and subsequently each death, will affect your scores, with points going up and down until someone reaches ten points or the timer runs out. Of course, you won’t know where your opponents are until you pass them by or if they chance an attack (as using your attack gives off light), so you’ll need to remain fully concentrated on the vibrations running through your controller. The second mode is called ‘Gold Rush’, this time adding a collectable treasure into the mix. Rather than simply knocking out your opponents, you’ll now need to keep hold of a treasure that appears in the centre of the stage, with opponents trying to knock it out of your possession before your timer runs out. If you manage to keep hold of it for long enough, you’ll secure one more point towards victory. Each of these modes can be played in one of nine stages, each varying in size, and these offer the only real difference from one game to the next. While the main concept is solid, and presented smartly and efficiently, games start to feel extremely repetitive rather quickly. With the same nine stages appearing in both modes, and with the only differences between them being different wall patterns, you’ll likely have had enough after just a handful of games. There are a couple of clever features woven into the game’s core that make Invisiballs a nicely polished piece of software, but this isn’t enough on its own. One such feature restricts the ability to simply spam the attack as you travel around each stage, with the power of your attack diminishing with each press in quick succession. If the game were to capitalise more on these relatively strong foundations, we could well have another decent party game lurking on the eShop, but without any further development the content is sadly lacking. Luckily, as early buyers will notice, a third option on the game’s main menu states that more content is coming soon. A quick word with the developer has told us that this third mode will have a bit less confrontation between players, with several treasures spawning on screen and a lesser punishment being dished out when you’re captured by an opponent. On top of this, another option will be added to include tricks and traps, hopefully enhancing the game by adding chaotic objects into the mix. Digital Kingdom has informed us that this update is expected to go live this summer, with more updates planned for additional maps and modes expected after that, too. This news is pleasing to hear, of course, and could well be just what the game needs to see it soaring upwards in our judgment, but it’s a shame that we’re currently faced with a package that feels slightly undercooked. As it stands, Invisiballs doesn’t provide enough content to justify the asking price, and we can’t imagine many players wanting to stick around for any longer than a dozen or so games. If you’re interested enough in the game’s concept, you might want to hold off and see exactly what content comes from these future updates. 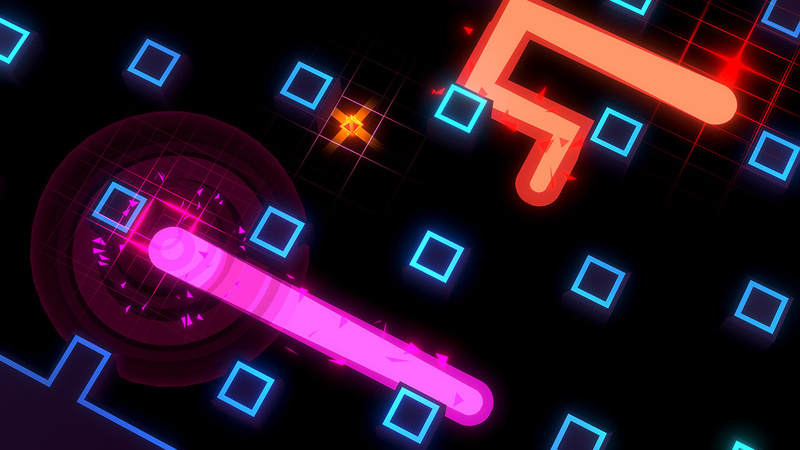 Invisiballs provides us with a competitive party experience that uses HD Rumble to good effect, allowing players to battle it out using only vibrations and quick thinking. The concept is a solid one, and the presentation does the job nicely, but a saddening lack of content across the game’s modes leaves us feeling rather underwhelmed. With multiple updates planned for the near future this issue could soon start to be addressed so, unless you’re entirely sold on the concept alone, we’d recommend holding off until these new features have landed. Solid review! I didn't even know this existed. Really looking forward to your guys' review of Yonder, Little Nightmares and Runner 3 Those are the next few indies I've had my eyes on. I wish NintendoLife did less reviews on these average games and gave more time to pointing out the games that are worth it. You can kind of tell from the title it's not a great game. @Pignot Agreed! There looks like so many good games have come out on the eshop recently but there have been no reviews about them. I’m pretty sure anyone could look at this game and give it a 5. No offense NintendoLife, don’t hate me please. I appreciate all the reviews on this site. Including this one. As a matter of fact I think the concept of this game is a lot of fun it's just lacking in content, hopefully a few future updates fix that. @Pignot How are they supposed to know if it's worth it unless they review it though? @Pignot I think it's great that they also shine some light on average games. These are types of games that, if a person is interested, they can weight the pros and cons and decide if they wanna spend the dough on the game. This is spot-on. You can't find the hidden gems unless you dig! A good example of this is Subsurface Circular. What's in a name, though? Does Celeste have a great title? Looks like someone took InvisiGun concept and put it on Switch before it was ported. But from what I understand InvisiGun is much better. @outsider83 Agreed. I guess those games would normally just go under the radar but a review shines light on stuff you might enjoy. But I just think that there are some better games out there which had more creativity and hard work put into them that are missing out on being shown off. @outsider83 I'm with @Pignot on this one actually. Yes it's nice to spotlight games that might be underappreciated, but I don't want NL to do that INSTEAD of reviewing games I already think I might want. I bought the game which was much more fun than I expected after this review. It's one of the rare games that you can play with game novices without spending hours explaining rules and still being super fun for everyone. Highly recommend it for game nights!